"SAF Tehnika" AS informs that on the 12th December 2011 it has received information that a private person – Inga Ozolina has decreased her holding in "SAF Tehnika" AS share capital on 6th December 2011. "Maleks S" SIA through which Inga Ozolina acquired her holding, has alienated part of the shares retaining in a posession 105 709 or 3,56% of "SAF Tehnika" AS share capital. On the 22nd of November SAF Tehnika JSC (NASDAQ:SAF1R), a premier carrier-class licensed and unlicensed microwave radio manufacturer appointed a current board member Aira Loite as chief operating officer. Ms Loite will lead a organization of over 165 employees and will be responsible for the operational leadership of SAF Tehnika as well as for finance and administration functions. New duties will be performed alongside the current position of the board member of the company. Previously, Ms Loite spent the last four years as the chief financial officer. Prior to joining the company in November, 2007, she worked for SIA Lattelecom (2006/2007) initially as a Business Performance Director and later as a Director of Business Information and Control division. Aira Loite has graduated University of Latvia with a degree in applied mathematics in 1988. She has been awarded the degree of Master of Business Administration by the University of Salford (UK) in 2009. "SAF Tehnika" AS informs that on the 21st November 2011 it has received information that a private person – Inga Ozolina has increased her holding in "SAF Tehnika" AS share capital on 8th November 2011. "Maleks S" SIA through which Inga Ozolina realized the holding, has purchased additional shares of “SAF Tehnika” AS, keeping in a possession 187 495 or 6,31% of "SAF Tehnika" AS share capital. SAF Tehnika JSC informs that on the 15th of November, 2011 it has received information from the Council Member Juris Imaks that he resigns position as of 11th November 2011. On the 14th of November SAF Tehnika JSC (NASDAQ:SAF1R), a premier carrier-class licensed and unlicensed microwave radio manufacturer will launch an on-line store www.saf-lastmile.com for unlicensed SAF FreeMile products, antennas and supporting accessories. The online store will carry the same unlicensed microwave radio systems that are already available from SAF Tehnika through European distributors and partners. Alongside strong delivery service and fully secure shopping mechanism, clients will also receive an online RMA service as well as online technical support. For the present, online shopping will be available only in EU, though SAF Tehnika will continue expanding its world reach of online shopping also to North American clients in early 2012. "As a European company, holding ourselves to the highest standards of quality, we are delighted to launch this online shopping platform to all, who are not covered with our existing distribution channels for reliable and cost-effective license free wireless backhaul equipment. We hope that our worldwide experience in delivering customized microwave solutions will support the sustainable growth of our clients also in this business segment," Janis Ennitis, COO of SAF Tehnika commented the launch. SAF FreeMile Full Outdoor radios for Ethernet packet data and E1 voice transmission, are designed and manufactured to operate in licence-free frequency bands of 17GHz and 24GHz. The system combines features like low interference operation, high availability at bad weather conditions, carrier-grade full duplex capacity with no cost of licensing and quick installation. All systems are applicable for any wireless network - fixed or mobile, in private or public companies and are available on the market since last year. To learn more about SAF FreeMile and the online store, clients are welcomed to visit the website www.saf-lastmile.com. SAF Tehnika is ISO certified with the products corresponding to standards of ETSI, FCC and Industry Canada. Research & development as well as complete production is performed in Europe with sales in more than 100 countries worldwide. According to the agreement No. L-ĀTA-11-0724 (Project No. ĀTA/2.3.1.1.1./11/29/028) concluded on the 21st of September 2011 between JSC "SAF Tehnika" and government institution "The Investment and Development Agency of Latvia" regarding the implementation of a project "Participation of JSC SAF Tehnika in international exhibitions", SAF Tehnika exhibited at „4G WORLD 2011” which took place from 25th to 27th of October in Chicago, IL, USA and at the „Africa Com 2011”, held in Cape Town, South Africa on the 9th and 10th of November. An annual event „Africa Com 2011” is the longest established and largest annual Pan-African communications event which provides the opportunity to meet and do business with telecoms decision-makers from all 53 African countries. During the exhibition, SAF booth #B6 was well attended by existing partners and customers, who showed the interest in closer cooperation. During the „4G WORLD” exhibition in Chicago SAF Tehnika launched a new product for North American market - 100 Mbps Full Duplex Licence Free microwave radio - SAF FreeMile 24 GHz. The booth #2215 was well attended and rather many substantial US contacts were gained for future cooperation. It should be noted that visitors showed the most interest in SAF FreeMile and CFIP Lumina. Attachment contains SAF Tehnika JSC yearbook 2010/2011. The Company's non-audited net sales for the first quarter of financial year 2011/12 were 2.89 million LVL (4.12 million EUR), representing 92% of the first quarter of the previous financial year. Compared to previous reporting quarter (Q4 FY 2010/11) which was the weakest in previous financial year this quarter shows recovering growth of 45% percent. Sales in Americas slightly more than doubled amounting to 1.33 million LVL (1.9 million EUR) compared to previous financial year's the first quarter being the largest part of the turnover. Sales in Europe and CIS region decreased by 25% comparing with the 1st quarter of the previous financial year and formed 23% of the quarterly sales. The largest fall in the quarterly sales comparing year-to-year was from sales in Asia Pacific, Middle East and Africa region where sales dropped by 46% or by 753 thousand LVL (1.07 million EUR). Company is looking for the most appropriate sales strategies for particular countries in order to regain previous sales levels. The net profit of SAF Tehnika for the first quarter of financial year 2011/12 was 477 thousand LVL (679 thousand EUR). The positive material impact on net result were from provision reduction for doubtful debtors as substantial part from old overdue debt was recovered and gains from foreign exchange rate changes as US dollar rate showed upward trend. The demand for wireless transmission equipment, which is SAF Tehnika's core product, is expected to be high over the coming years due to increasing usage of mobile devices worldwide. As the growing interest is noted for license-free 17 and 24 GHz frequency range, branded in SAF product portfolio as FreeMile equipment, the Company's plans significantly improve distribution mechanism to make these products more available to customers. SAF Tehnika will proceed with research and development of next generation wireless data transmission devices in order to meet evolving customer demand on high capacity equipment with ever better network management system. The Company will continue to consider different options for strengthening local presence in target markets. A subsidiary in North America launched in October - SAF North America is just another step in the Company's geographical expansion after the announcement of SAF Middle East foundation. The Company is financially stable, although due uncertainty in the global telecommunication market the Board of the Company cannot provide certain prognosis for sales figures despite positive results of the reporting quarter. SAF Tehnika has received third place in the Baltic Corporate Excellence Awards 2011 out of companies listed NASDAQ OMX Baltic market. Comparing with the previous year, there has been a significant leap in ranking for SAF Tehnika – from the 10 to third place. Experts agree that the performance is mainly influenced by company’s improved profitability, financial stability, corporate governance, spirit of the entrepreneurship and a good asset management. For the forth year, Riga-based financial research company CE Services together with „CE Asset Management” (Switzerland) and School of Business and Finance(Latvia) has conducted an extensive study to determine best stock exchange listed company in Baltic overall and in each country: Lithuania, Latvia, and Estonia. The project is organized in order to determine excellent companies in the Baltic stock universe and to motivate other exchange-traded companies to improve their corporate transparency, financial results and other aspects in order to become attractive investment targets. Audited annual report of SAF Tehnika JSC from the financial year 2010/2011 can be found in attachment. Attachment contains the report on the Corporate Governance of SAF Tehnika JSC from FY 2010/2011. 28th November 2011 is the planned account date on which the list of those holders of financial instruments will be fixed who will be entitled to dividends. "SAF Tehnika" AS informs that on the 18th October 2011 it has received information that a private person – Inga Ozolina has decreased her holding in "SAF Tehnika" AS share capital on 11th October 2011. "Maleks S" SIA through which Inga Ozolina acquired the holding, has alienated part of share capital retaining in a posession 147 931 or 4,98% of "SAF Tehnika" AS share capital. The Board of Directors of “SAF Tehnika” JSC (Reg.No.40003474109, legal address: 24a, Ganibu dambis, Riga, LV-1005, Latvia) informs that it convenes a regular shareholders’ meeting on 10th November 2011 at 11.00 a.m., at “SAF Tehnika” JSC meeting room (24a, Ganibu dambis, Riga, Latvia). Shareholders and their representatives can submit draft decisions regarding the issues of the agenda to be discussed on the shareholders meeting until 17th October 2011 at “SAF Tehnika” administration (Ganibu dambis 24a, Riga, LV-1005) every working day from 9.00 a.m. to 5.00 p.m. Draft resolutions on the issues of the agenda to be discussed on the shareholders meeting will be published on 27th October 2011. Draft resolutions will be available also on company’s webpage www.saftehnika.com, as well as at “SAF Tehnika” administration (Ganibu dambis 24a, Riga, LV-1005) every working day from 9.00 a.m. to 5.00 p.m.
Only persons or entities which are shareholders on the date of record will be entitled to participate in the shareholders’ meeting. The date of record is 2nd November 2011. Registration of participants will take place at the venue on the day of the shareholders’ meeting – on 10th November 2011 from 10.30 a.m. until 11.00 a.m. Representatives of shareholders at the registration have to show a power of attorney witnessed by a notary or a power of attorney legally equal to that and passport or other verifying document. The template of the power of attorney is available on company’s webpage. According to the agreement No. L-ĀTA-11-0724 (Project No. ĀTA/2.3.1.1.1./11/29/028) concluded on the 21st of September 2011 between JSC "SAF Tehnika" and government institution "The Investment and Development Agency of Latvia" regarding the implementation of a project "Participation of JSC SAF Tehnika in international exhibitions", on the 20th and 21st of September, SAF Tehnika exhibited at „NigeriaCom 2011" which took place in Lagos, Nigeria, and at the Comptel Plus 2011, held in Orlando, FL from 2nd - 5th of October. 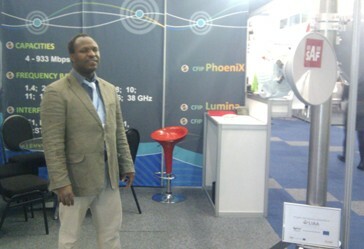 During the „NigeriaCom 2011" all product lines were presented, though the most interest was shown in the CFIP Lumina FODU, CFIP PhoeniX M Split Mount system and CFIP-108 FODU, which have already been used in numerous telecommunication solutions all over the world. SAF Tehnika's booth Nr.7 was attended mostly by African customers. During the „Comptel Plus 2011" show, representatives of SAF Tehnika met various existing and potential customers with an aim to present the latest microwave solutions as well as help to chose the best for each individual case. SAF Tehnika's booth Nr. 526 was well attended by existing partners and customers and prospects, who showed the interest in closer cooperation. "SAF Tehnika" AS informs that on the 28th September 2011 it has received information that a private person – Inga Ozolina has increased her holding in "SAF Tehnika" AS share capital on 20th September 2011. "Maleks S" SIA through which Inga Ozolina realized the holding, has purchased additional shares of “SAF Tehnika” AS, keeping in a possession 148 858 or 5,01% of "SAF Tehnika" AS share capital. On the 21st of September in 2011 JSC SAF Tehnika and the Investment and Development Agency of Latvia concluded an agreement No. L-ĀTA-11-0724 (project No. ĀTA/2.3.1.1.1./11/29/028) regarding the implementation of a project "Participation of JSC SAF Tehnika in international exhibitions" co-financed by European Regional Development Fund. Project expenses estimate altogether at 83.8 thousands LVL. By participating in exhibitions, the company has its goal to increase sales of SAF Tehnika products in all parts of the world and enhance SAF Tehnika brand awareness worldwide, strengthen cooperation with existing partners and attract new potential customers. SAF Tehnika in partnership with Latvian IT cluster is implementing the Project co-financed by the European Regional Development Fund „Future prospects for Latvian IT companies in export markets", aimed at promoting the IT products in foreign markets that have been developed by the programme partners. The Project is implemented within the framework of the 2nd operational programme „Entrepreneurship and Innovations" under sub-activity 2.3.1.1.1 „Capturing external markets - external marketing" (Project ID No. ĀTA/2.3.1.1.1/11/28/020; Agreement No. L-ĀTA-11-0714 signed with the Latvian Investment and Development Agency). Within the Project, SAF Tehnika representatives have already participated in the trade mission to North America, which helped to assess several product opportunities and accellerated the partners' network expansion in North America. On November it is planned to visit Brazil, where in July, with the special inauguration ceremony the start of CFIP Lumina production was announced. "SAF Tehnika" AS informs that on the 1st September 2011 it has received information that a private person – Inga Ozolina has decreased her holding in "SAF Tehnika" AS share capital on 25th August 2011. "Maleks S" SIA through which Inga Ozolina acquired its holding, has alienated part of its shares retaining 147 640 or 4,97% of "SAF Tehnika" AS share capital. 1. Approve the reports of the Board of Directors and the Supervisory Council for financial year 2010/2011. 2. Approve the annual report and release the Board of Directors from responsibility for financial year 2010/2011. 3. Pay dividends in amount of LVL 0.23 (twenty three santims) par share or altogether LVL 683 141.40 (six hundred eighty three thousand one hundred forty one lats and forty santims), but the remaining profit from financial year 2010/2011 and retained earnings from previous financial years - altogether LVL 1 915 331.60 (one million nine hundred fifteen thousand three hundred thirty one lats and sixty santims) - keep as company's retained earnings. 4. Appoint KPMG Baltics SIA as the auditor of the company for the next 2011/2012 financial year and to authorize the Board of Directors to agree upon auditors' fee. The calculation date is 28th November 2011. The payment date of dividends 30th of November. The Company’s non-audited net sales for 12 months of the financial year 2010/11 were 10.9 million LVL (15.5 million EUR) representing a year-on-year increase of 7%. Sales in the Asia Pacific, Middle East and Africa region formed the largest sales proportion (37%) comprising 4.05 million LVL (5.76 million EUR) although it was by 32% less than in previous financial year 2009/10. Sales have increased year-on-year both in Americas and Europe, CIS regions. The USA maintained its high business activity in spite of the economic collapse threat and protracted discussions on budget issues in the U.S. Congress. At the time when some large wireless Internet service providers in North America were struggling to fight off bankruptcy and competition among microwave suppliers had become more fierce, SAF Tehnika did capitalize on this opportunity by broadening the distribution network and strengthening the Company’s presence in the region - 68% sales increase was in Americas reaching 3 million LVL (4.3 million EUR). 55% increase was recorded for Europe, CIS amounting to 3.8 million LVL (5.5 million EUR). The net profit of SAF Tehnika for the 12 months of financial year 2010/11 was 780 thousand LVL (1.1 ,million EUR) representing 52% of the net profit of previous financial year 2009/10. SAF Tehnika’s non-audited net sales for the fourth quarter of financial year 2010/11 were 1.99 million LVL (2.84 million EUR), representing 53% of the fourth quarter of the previous financial year. Reporting quarter was the weakest in this financial year unlike from last financial year 2009/10 when fourth quarter was the best. Sales in Americas represented the largest part of 4th quarter’s turnover (48%) where sales rose by 40% or 271 thousand LVL (386 thousand EUR) compared with the same quarter of the previous corresponding period. Sales in Europe and CIS region formed 28% of quarterly sales, but were by 45% lower than in the 4thquarter of the previous financial year. The largest impact in quarterly sales comparative year-to-year decrease was from sales in Asia Pacific, Middle East and Africa region where sales dropped by 77% or 1.56 million LVL (2.22 million EUR). The main reason for decrease was the lack of similar scale projects in the fourth quarter of 2010/11 and various long-term project finalization in the third quarter. The net loss of SAF Tehnika for the fourth quarter of financial year 2010/11 was -108 thousand LVL (-154 thousand EUR). This is the result of comparatively low sales during the quarter, additional provisions made for doubtful debtor and losses from foreign exchange. It should be noted that according to the third parties research, total global shipments of point-to-point radios in the calendar year 2010 have decreased by 9.3% compared to 2009. Nevertheless, SAF Tehnika has gained 50% larger market share, thus taking the 12th position in the world rankings instead of the no. 17 the year before. The demand for wireless transmission products is expected to be high over the coming years and SAF Tehnika, by elevating the focus on the Company’s core competencies will continue to create new products that meet clients evolving needs and preferences. Furthermore, the Company has recently completed a long-term product development strategy focusing on the next-generation products and we are looking forward introducing the new version of CFIP Lumina in the near future. License-exempt SAF FreeMile products will be further developed and the deliveries of long-haul point-to-point microwave radio CFIP Marathon will grow as the demand of this Full Indoor unit is expected to rise in all regions, including Middle East, Asia Pacific and North America. On August 26, 2010, SAF Tehnika JSC and the Investment and Development Agency of Latvia (LIAA) signed an agreement No. L-ĀTA-10-0369 (Project No. ĀTA/2.3.1.1.1./10/17/021) on implementing the project "Participation of SAF Tehnika JSC in International Exhibitions" co-funded by the European Regional Development Fund. The total project cost was 99.9 thousand LVL. CommunicAsia 2011, June 21-24, Singapore. By participating in exhibitions, the company had its goal to increase sales of SAF Tehnika products in all parts of the world, find new markets and enhance SAF Tehnika brand awareness both in potential regions (USA, Africa) and the existing markets (Europe, CIS, Asia). In general, the company successfully participated in all exhibitions during 2011, acquired over 300 new contacts and met a lot of current partners from Europe and other regions. During exhibitions SAF Tehnika presented new and existing wireless data transmission equipment solutions, as well as provided individual consultations regarding products and their application, and advised on opportunities for cooperation. At one of the largest IT and telecom exhibitions CeBIT 2011 that took place in Hannover, the company presented CFIP Marathon 1,4 GHz - a product that is capable of ensuring high-quality long-range wireless data transmission. The figure of Jeļena Prokopčuka - a famous Latvian runner and two-time winner of the New York City Marathon - was used in the product presentation and attracted visitors' attention both to the product as such, and to SAF Tehnika booth in general - brochures with her on the cover were distributed in record-breaking time. On the whole, the most interest at exhibitions is still attracted by CFIP product line, which is the most modern and popular since its introduction in 2008. Top products are CFIP Lumina, CFIP PhoeniX and CFIP-108. 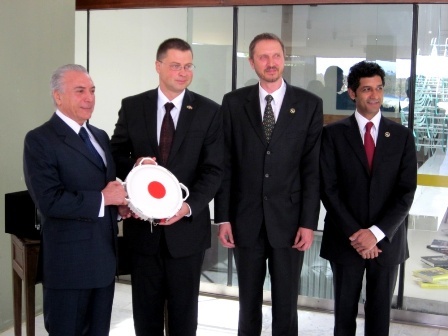 On 12th of July, 2011 the first CFIP Lumina wireless data transmission radio unit using SAF Tehnika technology was assembled in the capital of Brazil, Brazilia. Vice President of Brazil Michael Temer, Prime Minister of Republic of Latvia Valdis Dombrovskis, CEO of SAF Tehnika Normunds Bergs and President of wi2Be Amir Qamar presented the product. To finish the assembling process, the symbolic last screw was tightened to seal CFIP Lumina housing. The action was performed by Mr. Valdis Dombrovskis, Prime Minister of Latvia and Mr. Michael Temer, Vice President of Brazil, thus acknowledging support to bilateral cooperation between Latvia and Brazil. "This is a perfect example of cooperation between companies of Latvia and Brazil that promote the transfer of high technologies and acknowledge competitiveness of Latvia ICT industry internationally," said Valdis Dombrovskis, Prime Minister of Republic of Latvia. During the speech SAF Tehnika CEO Normunds Bergs thanked the audience: „In the name of the company and our partners I want to express gratitude for the shown honour in sealing the first CFIP Lumina housing produced in Brazil. We have been very careful in protecting unique wireless data transmission technology developed by SAF engineers, however having the mutual trust and insight of telecommunications perspective in the future with wi2be, we have shared the technology for production in Brazil and we hope the produced equipment will be successfully deployed for development of Brazil telecommunication infrastructure." Microwave is a protected technology in Brazil and all imported equipment is levied with significant duties and taxes resulting in high end-user pricing and long delivery times. Thus, to address the specific customer needs in Brazil, SAF Tehnika (Latvia) have united efforts with wi2be Tecnologia S.A. (Brazil) and SIEMENS Enterprise Communications (Brazil) by executing a unique echo-system where Full Outdoor Technology developed by SAF engineers has been especially tailored for manufacturing purposes at the SIEMENS factory in Brazil, while wi2be will take care of the product delivery to the customer. wi2be Tecnologia S.A. is a Brazilian company focused on the development, manufacturing, marketing, financing and support of high-capacity, IP-based wireless transmission solutions. The company executes its operations by managing strategic echo-systems where each partner contributes world-class capabilities. Wi2be products are manufactured at SIEMENS Enterprise Communications facilities in Curitiba, Parana under exclusive manufacturing and distribution licences from world's leading wireless transmission technology companies. The company distributes and supports its solutions through e-portal in Portuguese. For more information about wi2be Tecnologia please visit www.wi2be.com. SIEMENS Enterprise Communications is a premier provider of end-to-end enterprise communications, including voice, network infrastructure and security solutions that use open, standards-based unified communications and business applications for a seamless collaboration experience. SIEMENS Enterprise Communications located in Curitiba is a World Class Manufacturing plant. This plant delivers Siemens Enterprise Communications products and also provides Electronic Manufacturing Services for external customers. In 2010 Siemens Enterprise Communications plant located in Curitiba started a strategic partnership with wi2be, supporting their operations with manufacturing, logistics and repair services. For more information about SIEMENS Enterprise Communications please visit www.siemens-enterprise.com. SAF Tehnika JSC (NASDAQ: SAF1R), a world leading provider of carrier-class, licensed point-to-point microwave solutions, today announced the start of Full Outdoor Microwave Radio, CFIP Lumina production in Curitiba, Brazil in collaboration with wi2be Tecnologia S.A. (Brazil) and SIEMENS Enterprise Communications (Brazil). Microwave is a protected technology in Brazil and all imported equipment is levied with significant duties and taxes resulting in high end-user pricing and long delivery times. To address the specific customer needs in Brazil, SAF Tehnika, wi2be Tecnologia S.A. and SIEMENS Enterprise Communications are executing a unique echo-system where Full Outdoor Technology developed by SAF engineers has been especially tailored for manufacturing purposes at the SIEMENS Enterprise Communications factory in Brazil. SIEMENS Enterprise Communications is responsible for full supply chain solution including local manufacturing, repair & return and logistics whereas wi2be Tecnologia is executing sales, marketing, distribution and local support. An inauguration of the first locally produced CFIP Lumina full outdoor radio will be held on the 12th of July in Brasilia, capital of the Federative Republic of Brazil and attended by the Prime Minister of Latvia, Valdis Dombrovskis and The Vice President of Brazil, Michel Miguel Elias Temer Lulia. Full Outdoor Lumina radios are already Anatel (Agência Nacional de Telecomunicações) approved and have been deployed and well received by several Brazilian customers. Local production is under-way with first commercial units of Lumina in 6, 7, 8, 11, 18 and 23 GHz to be released in October 2011. With over 2000 ISPs, several fixed/mobile operators gearing to deploy 4G networks, Government backed PNBL (Plano Nacional de Banda Larga) initiative for the implementation of nation-wide IP backbone; Brazil, the host nation of 2014 FIFA World Cup and 2016 Summer Olympics, represents a significant market opportunity for the Lumina product line. "CFIP Lumina Full Outdoor radio has been the number one product among our customers for almost two years spent in the market and now we are proud to share the technology and our 7 year experience in Full Outdoor system design and manufacturing with Brazil," said Normunds Bergs, CEO of SAF Tehnika and the Head of the Delegation of Latvia's entrepreneurs. According to the agreement No.L-ĀTA-10-0369 (Project No.ĀTA/2.3.1.1.1/10/17/021) concluded on the 26th of August 2010 between JSC SAF Tehnika and government institution "The Investment and Development Agency of Latvia" regarding the implementation of a project "Participation of JSC SAF Tehnika in international exhibitions", from the 10th till 13th of May SAF exhibited at SVIAZ EXPOCOMM 2011 which took place in Moscow, Russia, and at the summit CommunicAsia 2011, held in Singapore from 21st till 24th of June. 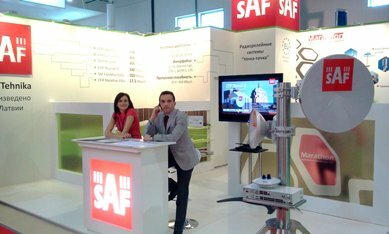 From the 10th until 13th of May SAF Tehnika participated at the exhibition Sviaz - Expocomm 2011, which annualy take place in May in Moscow Russia. SAF Tehnika's booth was designed especially for the exhibition, catching the most attention from visitors with its modern design and fresh colours. The booth Nr. 81C50 was well attended also by existing customers and prospects from Russia, Ukraine and other CIS countries. During the days of exhibition all SAF product lines were presented, however the most interest was shown in the CFIP product line - CFIP Lumina FODU, CFIP PhoeniX M Split Mount system and CFIP-108 FODU, which have already been used in numerous telecommunication solutions all over the world. From the 21st to 24th of June one of the most significant ICT events in Asia - the ICT summit CommunicAsia 2011 was held in Singapore. The event has been known since 1979 and more than 56,000 industry visitors and media from around the world attended both CommunicAsia2011 and BroadcastAsia2011 between 21 - 24 June. During the show, representatives of SAF Tehnika met various existing and potential customers to present the latest microwave solutions as well as help to chose the best solution for each individual case. 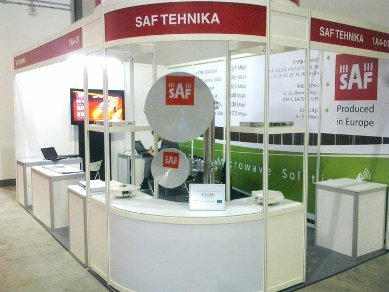 SAF Tehnika`s booth Nr. 1A401 was well attended mostly by visitors from India, Indonesia, Malaysia, China and Singapore. 09.11.2011 - Non-audited financial results of FY 2011/12 for Q1. 08.02.2012 - Non-audited financial results of FY 2011/12 for Q2 and 6 months. 09.05.2012 - Non-audited financial results of FY 2011/12 for Q3 and 9 months. 08.08.2012 - Non-audited financial results of FY 2011/12 for Q4 and 12 months. Project is implemented in program „Human resources and Employment” beneath activity 1.3.1.1.1. „ Employee training support program in order to increase competitiveness of the enterprises”, according to contract No.L-APA-10-0019 between LEtERA, Latvian Chamber of Commerce and Industry and the Investment and Development Agency of Latvia (LIAA). Project is implemented from Year 2011 - 2013. SAF Tehnika's non-audited net sales for the third quarter of financial year 2010/11 were 2.77 million LVL (3.94 million EUR) reaching the same sales result compared with the third quarter of the previous financial year. The company's non-audited net sales for 9 months of the financial year 2010/11 were 8.90 million LVL (12.66 million EUR) representing a year-on-year increase of 37%. Sales in the Asia Pacific, Middle East and Africa represented the largest part - 40% of 9 months revenues although it was by 354 thousand LVL (504 thousand EUR) or 9% less than in 9 months of previous financial year. The sales decrease in the Asia Pacific, Middle East and Africa was compensated by results in other regions - sales increased by 125% or 1.8 million LVL (2.6 million EUR) in CIS and Europe region and a 86% increase was recorded in the Americas amounting an increase by 945 thousand LVL (1.35 million EUR). The net profit of SAF Tehnika for the third quarter of financial year 2010/11 was 318 thousand LVL (452 thousand EUR) being by 48% less compared with the third quarter of the previous financial year, but by 8% more than the previous reporting quarter of this financial year. The net profit of SAF Tehnika for the 9 months of financial year 2010/11 was 888 thousand LVL (1.26 million EUR) which is by 366% or 645 thousand LVL (918 thousand EUR) better than the result for the 9 months of financial year 2009/10. The beginning of 2011 showed that the majority of microwave vendors are shifting towards a full outdoor solution to meet the growing demand for total network cost reduction. In this situation, the Company benefits as the one of the pioneers, due to the accumulated know-how and vast experience with full outdoor radio technology. Global economic recovery as well as consolidation of telecommunication equipment vendors are providing new opportunities for SAF Tehnika as independent and stable market player, shown by increasing growth of sales this year.To allocate the required resources to maintaining successful development, SAF will move from the regional approach towards country based operations. Joint venture foundation in Saudi Arabia is supposed to be followed by another foundation in other countries in the next quarters. SAF has also an opportunity to enter new customer segments with our latest products such as CFIP Marathon and SAF FreeMile, thus enhancing SAF brand awareness as well as increasing the Company's competitiveness. According to the agreement No.L-ĀTA-10-0369 (project No.ĀTA/2.3.1.1.1/10/17/021) concluded on the 26th of August 2010 between JSC "SAF Tehnika" and government institution "The Investment and Development Agency of Latvia" regarding the implementation of a project "Participation of JSC SAF Tehnika in international exhibitions", from the 1st till 5th of March, SAF exhibited at CeBIT 2011 which took place in Hannovere, Germany, and at the international convention ExpoComm Italia 2011, held in Rome, Italy from 30th till 31st of March. In March of 2011, SAF Tehnika has participated at two European exhibitions with an aim to promote new CFIP series products - the full indoor unit CFIP Marathon 1.4 GHz, the split mount CFIP PhoeniX M and the unlicensed Full Outdoor solution SAF FreeMile. From the 1st till 5th of March SAF Tehnika exhibited at CeBIT 2011, the leading annual event dedicated to the ICT industry bringing together market leaders and top decision-makers worldwide. SAF booth #B73 was well attended and many contacts were gained for future cooperation. It should be noted that visitors showed the most interest in CFIP series products - Lumina, SAF FreeMile and Marathon 1.4 GHz. The brochure of CFIP Marathon with Latvian marathonist Elena Prokopchuk on the cover, was in demand and attracted a lot of attention as an interesting promotional material. The booth was well visited by customers from Germany, Netherlands, Poland and Balcans, as well as by SAF partners from all Europe. On the 30th and 31st of March an annual event ExpoComm Italia 2011 took place in Rome. The event addresses the international ICT community and, for more than 20 years, has been the most important platform for presenting the ICT solutions and applications. The participation in the show with SAF partner TCON (Italy) was a brilliant opportunity to meet Italian customers personally thus providing effective face-to-face consultations about SAF products and network solutions. During the exhibition, SAF booth # A12 was well attended by existing partners and customers who showed the most interest about SAF FreeMile and CFIP Marathon products. On April 11, 2011 Ltd. "LEO RESEARCH CENTRE" has signed the agreement No. L-KC-11-0006 with the state institution "The Investment and Development Agency of Latvia" about implementation of the Project “Latvian electrical and optical equipment industry center of expertise” co-financed by European Regional Development Fund. As announced previously, company „SAF Tehnika” is involved in the competency centre of Latvian electric and optical equipment productive industry „LEO Research Centre”, which activity is related to the implementation of industrial researches, new products and technology development projects in electronics and research of electrical engineering industrial technologies and new product development. Since its foundation in summer of 2010 the vision of the competence centre is to become a leader and in Baltic States and substantial knowledge of the world's resources in a competitive market for electrical and optical technologies. With the EU support, competence centers have unified related businesses and scientific institutions with a common goal to create new, competitive products and technologies. Research and experimental development on time-sharing two-way packet transmission microwave environment. Today, on the 26th of April one of the world’s top microwave carrier-class licensed point-to-point manufacturers, SAF Tehnika JSC (NASDAQ:SAF1R) announced that it has signed an agreement to found a joint venture SAF Tehnika Middle East Ltd with NAJAHAT Development & Investment Company (Saudi Arabia) thus confirming Middle East as one of the strategic growth markets. SAF Tehnika Middle East Ltd. will be focusing on delivering reliable and robust customized microwave solutions for mobile backhauls, business services and broadband networks as well as on meeting the growing demand for cost-effective wireless solutions in the region. "Customer loyalty and sustained increase in demand are the main reasons, encouraging us to continue the market expansion” said Janis Ennitis, COO of SAF Tehnika JSC “and the foundation of SAF Tehnika Middle East Ltd. is just one step forward on this path”. Commenting on the joint venture, Mr. Amer Obbahji, CEO of SAF Middle East Ltd said: “We are pleased to partner with SAF Tehnika to deliver European quality communication solutions in the Middle East region. The main reason is that SAF Full Outdoor Radio systems as well as the whole SAF products portfolio is perfectly designed to meet our market requirements”. All SAF microwave systems are operating in high temperature up to +55º, penetrating dust and rain. In some cases signal can be transmitted over very long distances, thus demonstrating perfect suitability for the Middle East climatic and geographical conditions. Parties intend that SAF Tehnika Middle East Ltd. will be majority-owned by NAJAHAT Development & Investment Company and headquartered in Riyadh. SAF Tehnika is ISO certified, with R&D and complete production in Europe and sales in almost 100 countries worldwide. On the 12th of April SAF Tehnika JSC announced the deal between Crossover Distribution Corporation and a service provider Manitoba NetSet Ltd. for deploying 200 links in Manitoba province, rural Canada. Manitoba NetSet Ltd. has been awarded funding from Industry Canada as part of Canada’s Economic Action plan to extend its fixed wireless broadband coverage to the underserviced and un-serviced regions of the Province. This deal brings SAF Tehnika to the next level in the North America market as well as opens up new opportunities for building brand awareness in the region. New experience helps to strengthen SAF Tehnika presence in North America as well as deliver the message about the company as a full-cycle European manufacturer, delivering quality microwave equipment in 99 countries worldwide. All shipments will be delivered until the end of the year. Financial details are not to be disclosed. Considering current situation in North Africa and Middle East countries and the interest from society expressed regarding the impact of events in those countries on SAF Tehnika business, SAF Tehnika informs that it currently has no large and essential deals there which could affect our business operations and financial results. SAF Tehnika expresses its compassion to victims from conflict regions and supports solutions which will provide for peaceful and reasonable adjustment of situation. SAF Tehnika non-audited net sales in Asia Pacific, Africa and Middle East countries for 6 months of the financial 2010/2011 represented 46% of the 6 months turnover. The sales growth in this region showed the largest increase during last years. It should be noted that sales increase comparing to previous financial year was recorded also in all other regions where SAF Tehnika exports its products - Europe and CIS, as well as North and South America. The Interim report for Q3 and 9 months of financial year 2010/2011 will be published on May 11, 2011. The Management Board of SAF Tehnika AS confirms that the aim of the company is to do business with a profit and there is a prognosis for a positive net result in the 3rd quarter. To make it more precise, there is no client with a turnover more than 15% in the last 12 months (and not 10% as was said in the interview) comparing it with the whole turnover in that period and SAF Tehnika AS continues to work on either the increase of the sales to the current clients and the broadening of the circle of the clients. The Management Board also confirms that the process of the buy-back of the shares planned on January 2009 was not executed in defined 18 month period and there is no information received at the moment that the shareholders desire to announce the process of the buy-back of the shares once again. According to the agreement No.L-ĀTA-10-0369 (project No.ĀTA/2.3.1.1.1/10/17/021) concluded on the 26th of August 2010 between JSC "SAF Tehnika" and government institution "The Investment and Development Agency of Latvia" regarding the implementation of a project "Participation of JSC "SAF Tehnika" in international exhibitions", we inform that SAF has exhibited at ISC Solutions 2010 (New York) and at the international convention Africa Com 2010 (Cape Town). As a use of communication technologies for security systems remains essential, on the 3rd and 4th of November SAF Tehnika participated at ISC Solutions 2010, held in New York, with an aim to promote SAF products and solutions as well as to increase an international brand recognition. SAF Tehnika booth# 1823 was well-attended and nearly 70 substantial US contacts were gained for future cooperation. It should be noted that visitors showed the most interest in CFIP series products - Lumina and CFIP-106 FODU. On the 10th and 11th of November an annual event Africa Com 2010 took place in Cape Town. It is the longest established and largest annual Pan-African communications event which provides the opportunity to meet and do business with telecoms decision-makers from all 53 African countries. 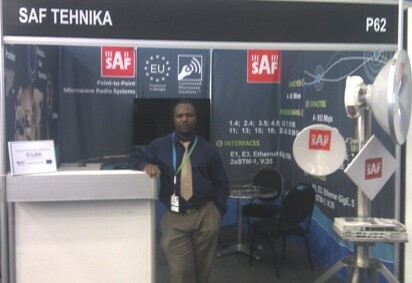 The participation in the show helped SAF Tehnika to strengthen it's reputation as a well known leading microwave equipment vendor in Africa. During the exhibition, SAF booth# P62 was well attended by existing partners and customers, who showed the interest in closer cooperation. SAF Tehnika's non-audited net sales for the second quarter of financial year 2010/11 were 2.97 million LVL (4.23 million EUR) representing a 44% increase compared with the second quarter of the previous financial year. The company's non-audited net sales for 6 months of the financial year 2010/11 were 6.13 million LVL (8.72 million EUR) representing a year-on-year increase of 65%. Sales growth was recorded in all regions. The largest growth was in the CIS and Europe where sales increased more than two times amounting to 2.27 million LVL (3.23 million EUR), but sales in America almost doubled reaching a total of 1.06 million LVL (1.5 million EUR). The largest part of sales (46%) in 6 months was represented by sales from the Asia Pacific, Africa and Middle East countries (2.81 million LVL or 3.99 million EUR). The net profit of SAF Tehnika for the second quarter of financial year 2010/11 was 293 827 LVL (418 079 EUR). The net profit of SAF Tehnika for the 6 months of financial year 2010/11 was 570 427 LVL (811 644 EUR). To boost the company's competitiveness, it will continue to focus on efficiency and quality in all general operations reaching a competitive edge for next level products as well as extending its product niche in the wireless product spectrum. SAF Tehnika JSC (NASDAQ: SAF1R) is proud to be awarded as the company with the Best Investor Relations among small cap companies in 2010. SAF is a long-standing in this category and has received the award for the fifth year in a row. SAF Tehnika has been a publicly traded company in NASDAQ OMX Riga since 2004 and as it was announced before, the company has received also a special award for the biggest rise in share price in Latvia in 2010 - since the beginning of the year the share price has increased by 629,17%. The winners of the Baltic Market Awards 2010 were announced at a live broadcast ceremony on the 20 th of January in Riga. The purpose of the international Baltic Market Awards project is to highlight the best investor relations in financial and non-financial reporting and improve the overall standard of investor relations among listed companies, as well as provide them with individual evaluation and consultancy from stock exchange side. of "SAF Tehnika" AS share capital. to 9.96% of share capital of "SAF Tehnika" AS.